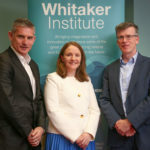 Dr Jane Walsh, Director of the mHealth Research Group and Co-Director of the Health and Wellbeing Cluster in the Whitaker Institute at NUI Galway, will play a lead role in a recently announced major Irish Cancer Society funded research project exploring ways in which cancer patients who have gone through treatment can feel better, both physically and psychologically. She will co-lead this research with Dr Janice Richmond, Advanced Nurse Practitioner in the Oncology Department at Letterkenny University Hospital and they will be supported by Clinical Trials Nurse, Ms Mary Grace Kelly. Dr Walsh and Dr Richmond will co-lead a team of six researchers, working in collaboration with Ms Kelly and the wider clinical team in Letterkenny University Hospital. The research will recruit 120 participants who will be attending the cancer unit in the hospital. Half will be given support and advice to improve their diet and activity levels. They will be compared to another 60 people who will receive the standard follow-up care. A wearable device will be used by all participants to monitor diet, sleep and exercise patterns. All participants will have their health assessed in the middle of the study and at the end of the six-month study period to establish whether there have been any improvements or not. This research will be funded by the Irish Cancer Society with support from Relay For Life Donegal.